The Patsy Pond Nature Trail is managed by the North Carolina Coastal Federation in cooperation with the Croatan National Forest. It winds through an area called the “Longleaf Pine Flat Woods,” which is an open woodland of longleaf pines with low-growing herbs and shrubs. Click here to view the trail map. The Croatan National Forest includes 156,576 acres and spreads over three counties: Carteret, Craven and Jones. The word Croatan means “Council Town” and was derived from the name of the North Carolina Native American Tribe called the Croatans. The Croatan is almost surrounded by many waterways: Neuse, Trent, White Oak and Newport Rivers. This placement helps to explain the forest’s historical role in the North Carolina economy through agriculture and the manufacturing of pitch, tar, rosin, turpentine and lumber for ship masts and construction. Entry/Exit points: The trail begins and ends on N.C. 24 between Morehead City and Cape Carteret, across from the North Carolina Coastal Federation’s office. Restrooms are available across the street at the North Carolina Coastal Federation office; 8:30 a.m.-5 p.m. M-F.
Not permitted: smoking, fires, alcohol, recreational/off-road vehicles, dumping and firearms. Visitors are strongly encouraged to wear highly visible orange vests or hats during the two hunting seasons: Oct.-Feb. and April-May. Vests are available at the federation office. Be aware of biting insects, venemous snakes and poisonous plants. The trail winds through an area known as the Longleaf Pine Flat Woods. You will see an open woodland of pine trees with low growing herbs and shrubs in the understory. Only an estimated 3.3 million acres of longleaf pine forest remain of the 90 million acres that existed along the eastern and gulf coasts. The name pocosin is a Native American term meaning “swamp on a hill.” These raised shrub bogs are formed from the buildup of organic matter over thousands of years. Look for stands of dense vegetation filled with low-lying shrubs and small trees. The ponds on the trail are groundwater interception ponds that get their water supply from the ground. The water gets its dark color from tannic acid, which comes from peat (decaying matter and pine needles). These shallow ponds do not have many fish because of this acidity. Along the edges of the ponds, visitors may see carnivorous plants including bladderwort and sundew. When rain falls through the atmosphere, it combines with carbon dioxide to form a weak carbonic acid, which soaks through the soil. If the subsurface layer is limestone, the acid can cause it to dissolve. As the limestone dissolves, holes are created underground that may later collapse, forming a sinkhole. There are several small sinkholes along the trail. Listed as an endangered species since 1970 due to loss of longleaf pine habitat. Small, with a black and white barred back, a black cap and white cheek. Tiny red tuft or cockade on the male is barely visible to the unaided eye. Nests are made 20-50 feet high in living longleaf pines. Trees with nest cavities are marked with white bands by the U.S. Forest Service. A threatened species in North Carolina due to loss of habitat. Pasty Pond and the surrounding ponds are important egg laying sites. Ideal habitat is an unshaded pond surrounded by longleaf pines and wiregrass. 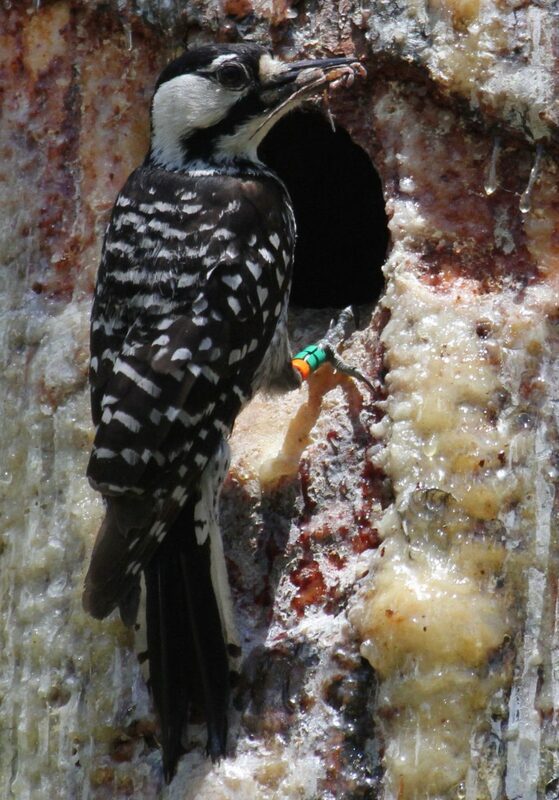 Red Cockaded Woodpecker. Photo by Sam Bland. Carolina Gopher Frog. Photo by Jeff Hall.